This is one of the flower spirits featured in my book “Wildflower Spirit Journey through Central Australia’. The common name is Western Nightshade. The nightshade family of plants includes potatoes, capsicum, egg-plant, tobacco, pituri and tomato. 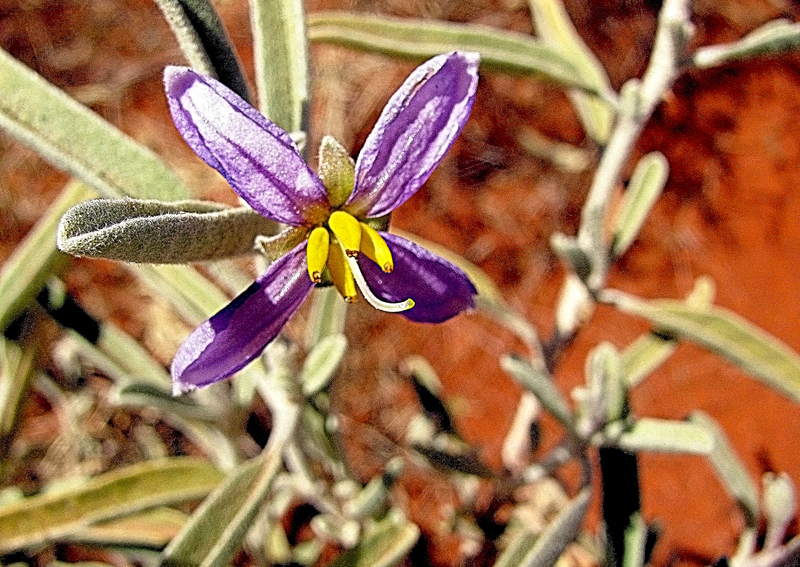 This is a wild tomato, but unlike the other Central Australian wild tomatoes (of which there are many! ), Western Nightshade has 4 purple petals instead of five. It still has the characteristic plump round fruit, which can vary in colour from green to yellow to red to brown to black, depending on the particular species and the stage of fruiting. In my book, I write about the spirit medicine of this flower. Western Nightshade heals the ancestral line, so I often refer to it fondly as ‘The Ancestral Flower’. On a metaphorical level, this line represents your family ancestry and your relationship with it. The ancestral line can be found running down through the midline of the energy field. One end of this energy line is found at the front of the heart chakra and the other end exits the body neat the tail-bone i.e. base/root chakra. In the energy field, this line stores information about, and an energetic connection with, your ancestral line. Healers access and travel along this line when working with clients, so they can study the family history, conditioning and personality/behavioural patterns that might be influencing and shaping the client. While all of the tomato plants I’ve met so far work with the ancestral line in some manner, Western Nightshade’s special skill is to identify the gifts or strengths buried in our ancestral line and to help us access them. When I met this beautiful flower in Central Australia, it helped me access my maternal Grandmother’s unlimited capacity for kindness, humility, patience and acceptance during a moment when all I really wanted to do was act like a spoiled brat, have a tantrum and lash out at my husband. My grandmother was a deeply spiritual person. I’m not sure what faith she was raised with specifically, but she did tell me once that she considered herself a Christian and her funeral took place in a local Christian church. But you never really heard your talk about spirituality much, at least, not in direct terms. She just walked her talk without saying much. And I don’t remember her going to church. Grandma was a doctor, a woman of science, but she believed in God and she believed in kindness. ‘Thou shalt not Judge’ seemed to be her motto in life, and one I always admired. Grandma role modelled this value for me, and with the help of Western Nightshade I was able to access it during a dark night of the soul, but even if I hadn’t known my Grandmother, this value would still have been accessible to me because it’s stored in my ancestral line. If you like, you can think of the ancestral line as being a bit like your family’s unique auric or psychic DNA code, of which you are a part. I sometimes think of the ancestral line as a snake, snaking its way through time and history, connecting all the members of a family together over time, with energy able to flow back and forwards along its length. Essentially, this is an energy line that exists inside you as part of you, but it also travels backwards through time into the bodies of your ancestors…. and forwards through time into the bodies of your descendants. Psychic healing exists outside of the normal space/time rules we are familiar with in the physical world, so this can take a bit of getting your head around, but your aura stores your history and your future possibilities. It exists at all points in time, in all places, like a multi-dimensional hologram. When you heal something within yourself, this healing and the implications of it, travel forwards and backwards along your ancestral line, impacting both your ancestors and your dependants. Every healing changes both the future and the past (or at the very least, it chafes the way we see/experience it). If I heal something within me, the energy shift created by this healing travels like a gift along all the energy pathways that connect me with my family (my ancestral line). You could think of this as being a little like a tree with many branches: a family tree. Except that it a living energetic structure rather than a picture on paper. The healing might flow to my sister, my daughter, my mother and my great great grandmother. It goes where it is needed. We are all one and from a broader holistic perspective, the further back you stand, the more you see the oneness.